Worlds-bestpharmacy.com sells drugs for the sensitive and confidential physical problems associated with men’s health, erectile dysfunction (ED) to be specific. It sells both generic and brand name medicines. Technology has reached a great height in these modern days. Online shopping has also become very popular among many people. Like all other commodities, medicines are also available online these days. Many online pharmacies sell different medicines to cater to the needs of a large number of customers every day. It’s cheap and saves time as well. Worlds-bestpharmacy.com is one of those online drug stores that delivers medicines at people’s doors at an affordable price. Customers of Worlds-bestpharmacy.com must submit a prescription authorized by a licensed physician in order to buy medicines from this online store. All the medicines sold on this online store are manufactured in India. The online pharmacy manages a very efficient customer care department that consists of live support, toll-free numbers, email along with the traditional ‘contact us’ method. Products are sold at a very affordable price on this online store. Customers need to pay only $ 1.07 for a generic Viagra on this drug store. A flat discount of 5% is provided with every 1st re-order and this increases by 1% with every next order after that one. For any reason, if a customer cancels an order, that increase is not added to the discount % for the next order. Customers can also get free samples of either 4 Viagra or 2 Cialis pills with every order of 60 or more pills. They get to choose the bonus sample pill type as well. Free pills are also provided with an order of 90 or more pills. In this case, the entire shipment is divided into two separate packages—the first package of 30 pills gets 4 free pills as a gift, whereas the second package carries the remaining 60 pills of that very order. 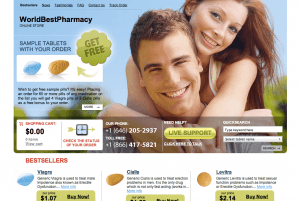 There is no mention of any coupons provided by this online drug store. Customers can use credit cards or MoneyGram or Western Union in order to pay for their drugs. Orders are delivered via courier service and Unregistered International Airmail. Courier service takes 5-9 days for a fee of $30, while the airmail takes 10-21 days for a fee of $10. In order to purchase brand-name medicines, a customer has to accept the orders through courier service only. Being more expensive, the courier service provides the customers with the facility to track their shipments with a tracking number which is not provided by the airmail. If an order gets lost on its way or doesn’t reach the destination, the online store will provide the concerned customer with full refund or a free reshipment. But it will not take any return of a delivered order from the customer due to restrictions of law. As for consumer reviews, this store had a limited review pool from its consumers. However, the shop’s few online comments indicate buyer satisfaction for the service of this drugstore. Most of the consumers stated that they were happy with the service given to them by the Worlds Best Pharmacy support team and were also happy with the product prices for the items sold on the website. Buyers also explicitly stated their intent to reorder form the shop since they were impressed with the performance of this web drugstore. However, this shop is now closed—the Worlds Best Pharmacy has stopped its service due to some unknown reason, leaving consumers to wander off from one web pharmacy to another. Still, I think that this former web drugstore is good enough to be rated with a score of 4 out of 5 for its service. Nonetheless, I am recommending the use of other web drugstores to replace this shop for your generic medicine needs—use our list of top vendors to cut your efforts in searching for good online drugstores to shop from! Medsmex.com Review – Is it closed or what? 6 years ago | 11 Comments on Medsmex.com Review – Is it closed or what?